This Saturday two-hour lecture considers the future of South Africa’s food system in relation to three main areas of concern: the nutrition transition which has seen both wasting and undernutrition in young children and increasing levels of obesity in older children and adults; the role of the private sector and market forces in the food system (four major companies account for 97% of sales within the South African formal food retail sector; increasing numbers of people buy food with social grants rather than produce food); and identified threats to the food system, including climate change, food waste, the scarcity of arable land and water and depletion of fishery stocks. Pdfs of the recommended reading are available on the Summer School website page for this course. 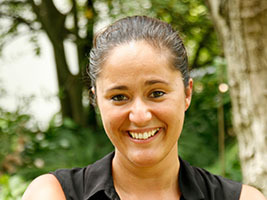 Laura Pereira completed her BSc majoring in Zoology, Ecology and Law at the University of the Witwatersrand (Wits) in South Africa in 2005. Having received a Wits University Council Scholarship for study overseas, she moved the Oxford University School of Geography in 2007 where she did her MSc in Nature, Society and Environmental Policy at St Hilda’s College. In 2008 she received a Clarendon Scholarship and an Oppenheimer Memorial Trust Grant to further her studies at Oxford. She was also awarded a Commonwealth Scholarship for the academic year commencing September 2009.Following a stint as a Future Agricultures Consortium (FAC) early career fellow, she became a Giorgio Ruffolo and Gundle Public Service Post-doctoral fellow in the Sustainability Science Program at Harvard's Kennedy School. She then moved back to South Africa and completed a post doc at UCT under the bio-economy chair and was then employed at the Centre for complex systems in Transition at Stellenbosch university under the GRAID project. She is now based at the Centre for Food Policy, City University of London, working on a Wellcome Trust funded SHEFS project.